Don’t those look delicious? Mmmmm, carrots. I came up with the idea of a Snack Girl reader recipe swap while on the treadmill at my new gym. I have started walking inside because it is so bleeping cold outside. This sweet woman next to me was talking about how she was working off all of the holiday cookies that she inhaled. She told me that she gets together before Christmas with 7 of her friends. They all make 8 dozen cookies, bring one dozen to eat at a party, and then give each other the rest. You couldn’t do a salad swap, of course, because you would have a ton of salad to eat in a short period of time. But, you can still swap recipes! I decided it would be fun for all of us to share our favorite recipes so we could all get inspired to eat more vegetables. This month, we will attempt carrots. Why carrots? They are in season, inexpensive, and everyone can find them. I was going to create an original to Snack Girl carrot recipe, but I ran out of time. The recipe below for pickled carrots is my FAVORITE. You cannot go wrong. They are delicious with a sandwich or as a crunchy pre-dinner snack. Please try it and let me know what you think. Please share your winning carrot recipes. Peel and slice carrots into sticks. If you are using baby carrots you can skip this step. Pour water and rice vinegar into a small saucepan. Mix in sugar, salt, caraway seed, and pepper and bring to a boil. Cook until the sugar and salt have dissolved, about 1 minute. Add the carrots and parsley. Cool to room temperature and transfer to a storage container. Can be eaten in one day or up to one month. I love the idea of a vegetable swap! lol! The cookie swaps kill me! Love the recipe for pickled carrots, great idea!! Is that a quarter cup of parsley? This looks really useful as a lunch box treat. Do you store in fridge? I like to take baby carrots (but you could use peeled large carrots too), brush a bit of olive oil on them, then season them with some herbs, and roast them till they are soft. You can mix them with other veggies or have them alone. Its a great easy side dish! I always keep a bag of baby carrots on hand and I am going to make this this weekend. Thanks. Looking forward to all the great vegetable recipies that will be coming our way. I have a feeling I will be doing alot of cut and paste. Ok this is more of a recipe request lol. Anyone got a crockpot sweet carrot recipe? I have a huge bag of carrots and I love them roasted with brown sugar, but I'd like to just do it in the crockpot today. I cut carrots into sticks, mix with a little olive oil, thyme and black pepper and roast in the oven. It brings out the great sweetness in the carrot and is a great winter side dish. Like Cindy said, you can mix other veggies with them, like potatoes, rutabagas, parsnips, turnip...oh the possibilities! I like to cut carrots (or parsnips) into sticks and put on a cookie sheet with a drizzle of sesame oil. Shuffle the carrots around so they're coated (sometimes I add a little grapeseed oil to thin out the sesame oil) and sprinkle sesame seeds all over the carrots. Roast in the oven at 350 for 20 minutes or until tender. Sesame seeds and oil have a lot of good nutrients and this is a good way to sneak them in! Love, love, love this idea. Will be making pickled carrots soon. Looks delish! One of my favorite ways to cook up carrots is roasted them in the oven. Cut lengthwise and coat in a mix of balsamic vinegar, minced garlic and a little olive oil and lemon juice. Cook for about 2-30 minutes at 400 degrees and you have a very simple, healthy and delicious little side dish! I made these the other day. Yummy! Next time I will let vinegar cool first, as it 'cooked' the carrots a bit by dumping the hot mixture on them. Kids liked them too! A recipe swap! Excellent idea! Spread carrots on a cookie sheet or jelly roll pan. Roast for 25 minutes, tossing halfway. After 25 minutes, add the peas, toss and roast another 10 minutes. *I find this brand of broth paste to taste very homemade and it makes over 9qts per jar and costs $6! I use it sparingly even tho its low in salt. I don't blend this bisque totally smooth; it stays a bit lumpy which is a great texture. It gets 5 stars. I saw this in TV the other night. In a 12-inch saute pan over medium heat, combine the carrots, butter, salt and ginger ale. Once simmering, remove the lid, stir, and reduce the heat to low. Cover again and cook for 5 minutes. Remove the lid, add the chili powder and increase the heat to high. Cook, tossing occasionally, until the ginger ale is reduced to a glaze, approximately 4 to 5 minutes. Pour into a serving dish and sprinkle with the parsley. Absolutely love your idea! Can't wait for more! 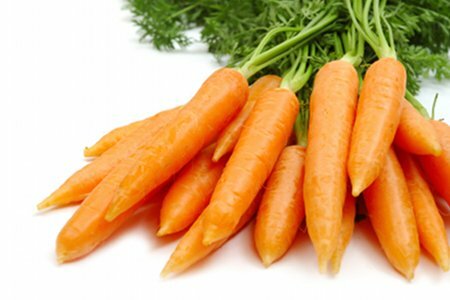 Cook carrots in boiling salted water until just tender, about 15 minutes. Drain. Meanwhile, in a small saucepan, combine sugar, cornstarch, salt, and ginger. Cook 1 minute longer; stir in butter until melted. Pour over hot carrots, tossing to coat evenly. Serve immediately. boil baby carrots until tender-crisp, drain add orange juice (about 1/2 cup)and honey (good squirt) let simmer until glazed. generally Iam not a salad person,but I make a carrot salad which tastes great and goes really wwell with BBq foods. It's grated carrot,chopped up prunes,walnuts broken up into pieces and a drizzle of walnut oil.I also sometimes add little pieces of serrano ham,but it is great without. I love carrot raisin salad but I don't eat it very often because it's loaded with mayo. I don't like the taste of the lighter versions of mayo so does anyone have any suggestions for a substitution that would taste similar or maybe even better?